Paul Taylor is training with Posh. Paul Taylor is back at the ABAX Stadium. 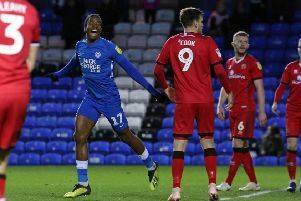 The 28 year-old striker is training with Peterborough United as he attempts a comeback after a year out of the professional game. Lewis Freestone (left) and Cameron Gow will play for Posh at Boston. Photo: Joe Dent/theposh.com. Taylor, who enjoyed an excellent season in the Championship with Posh in the 2011-12 campaign, saw his career leave the rails after a £1.5 million move to Ipswich in August 2012. He played 53 times for Posh, scoring 12 goals. Taylor did return for a brief loan spell with Posh in September 2013, but he hasn’t played a competitive match since April, 2015 when on loan at Blackburn. Off-field issues have dogged his career. New Posh boss Grant McCann is keeping a watching brief for now and there’s no chance of him appearing in tomorrow’s opening pre-season friendly at Boston United (July 9, 3pm kick-off). “There’s no doubt that a fit Paul Taylor would be one of the best players in League One,” McCann stated. “But he is nowhere near fit. Gwion Edwards (left) will not feature at Boston. Photo: Joe Dent/theposh.com. “He looks sharp though and he’s impressed the coaches during the two days he’s spent with us. Posh will be without new signing Gwion Edwards, vice-captain Michael Smith and Jermaine Edwards at Boston because of knocks. The rest of the squad will play a maximum of 45 minutes against National North League opposition. The squad has been supplemented by youth team players Lewis Freestone, a left-back, and midfielder Cameron Gow. Both are 16 years old. McCann added: The two boys have impressed me this summer so they will get 45 minutes apiece. “That’s the most anyone will get tomorrow and against Boreham Wood on Monday (July 11). We’ll build that up to hour-long appearances for some against Norwich next weekend (July 16). “The lads have had a tough fortnight and some of them looked very tired today (July 8), but I don’t want anyone feeling sorry for themselves. The hard work they put in now will stand them in good stead when the League One season gets going. “These friendlies are all about building fitness, and for finding the right partnerships and combinations. The results are not that important. I’ve seen teams go well in pre-season and then start the serious stuff badly.